Gas boilers are extremely reliable and efficient, however given that they are typically in use 24 hours a day, every day of the year, it is inevitable that from time to time you will encounter problems. Knowing how to find, diagnose and fix common boiler faults can help you to resolve many common problems without the expense of calling out an engineer. Read on to learn more. If you have suddenly discovered that you unexpectedly have no heating or hot water, it is natural to assume that there is a fault with your boiler. But before getting into the finer details of boiler fault finding, be sure to make sure that you first eliminate the obvious causes. In many cases, there may not be a problem with the boiler itself but a problem with the supply. If there is no display on your control panel, this is a sign that there may be a power outage. This can be confirmed by checking a socket or light. Don’t forget to check your balance if you have a prepay meter. Be aware that other sockets or lighting may be on a separate circuit, so if you have power elsewhere the problem may be isolated to the boiler itself. To check the water supply, turn on a cold tap and see if there is water. Likewise, turning on a gas hob or fire will quickly tell you if you have a water or gas supply. If the supply has been interrupted, you can either wait until it is restored or contact your supplier for more information. Many utility companies now display live outages on their websites. When it comes to combi boiler fault finding, another common reason that you may have no hot water or heating but not see any fault code is a broken or incorrectly set timer or thermostat. Check that neither has inadvertently been changed, and make sure that the heating responds if the thermostat temperature is raised. A common cause for no hot water or heating is low boiler pressure. There are several possible causes for this, but luckily most can be easily resolved. See our article on what to do if you have low boiler pressure for more information. Once any of the above have been eliminated, then the best approach to combi boiler fault finding is to check the user manual. If you don’t have the printed copy to hand, don’t panic - most manufacturer’s manuals are now available to view and download online. The most important information you’ll need is the make and model of the boiler, and sometimes the year. This information can usually be found somewhere on the control panel. Once you have access to the manual for your boiler, you should be able to find a description of the fault code that is displayed. Be aware that fault codes for different models may have different meanings, so it is important that the information you have is correct. 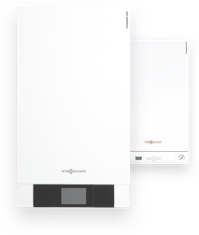 If you have a Viessmann boiler, you may wish to use our handy online fault code finder. If the fault can be fixed by the user, this will be indicated in the instruction manual along with instructions on how to fix it. It may be necessary to reset your boiler - instructions for this can also be found in your manual. Always consult a Gas Safe engineer if you are not confident about fixing the problem yourself, or if the instruction manual advises you to do so. Some faults can only be fixed by a trained engineer. Although the vast majority of boiler faults can be easily fixed, there are some situations where it may be advisable to replace your boiler. This is particularly the case if your boiler is 10-15 years old, and worth considering if you are finding that you are experiencing faults on a regular basis. If the problem is caused by a faulty component, your engineer will also be able to advise you if a replacement boiler is the better option. Another sign that it may be worth considering replacing your boiler is if you are finding it hard to keep your radiators or water warm enough even when all the settings are correct. This may be because your boiler has lost efficiency due to its age, or because it is simply not big enough to meet your demands. In either case, a trained engineer will be able to advise you further.